“The Cambodian economy, which should continue to grow now, seems to be like a jammed brake, because investment capital this year declined up to [the figures available for] November, where foreign investment capital for construction, which is an important sector, decreased by more than 12%. Tens of thousands of workers are laid off, and this affects one important part of industry and then also others. “The financial crisis strongly affects the construction sector in Cambodia, because big investment capital is mainly coming from foreign countries; as for investors from South Korea, they are directly affected by the meltdown of the economy in the United States of America. “The latest figure of the Royal Government published, said that during 11 months of 2008, investment in the construction sector and in related furniture development declined by 12.5%; compared to the same period of last year, it declined from US$3.2 billion to US$2,8 billion. This figure is from the Ministry of Land Management, Urban Planning and Construction. “The above problems result from the decline of construction, from the prices of furniture materials, and from the meltdown of the world economy as a whole, while the construction sector around the world encountered also the same problems during 11 months of this year. “As for Cambodia, the labor unions say that 30% of the construction workers are laid off, and various projects are suspended. The Ministry of Land Management, Urban Planning and Construction said that Cambodia had between 45,000 and 50,000 workers employed, with salaries between US$60 and US$1,200. “Senior Minister and Minister of Land Management, Urban Planning and Construction H.E. Im Chhun Lim said that such meltdown happened at the same time of foreign investment projects being under development, and it is forecast that in 2009 the decline will continue. “The problems in the construction sector strongly affect the prices of construction materials… prices declined around 30% to 40%; but even so, such materials cannot be sold, and businesspeople who had invested in this sector mostly did it depending on bank loans. “He went on to say that big construction projects, such as the construction projects of the CamKo City [Cambodian-Korean City], or the double Gold Tower 42 [42 stories], and of the International Finance Center Tower, are still in progress, but they are not stable. “Between June and November, there were around 1,869 construction sites countrywide, while in 2007, there had been 1,942. “It is the first time that figures are released, after press reports had said that big construction projects in our country – in Phnom Penh – have all closed down. 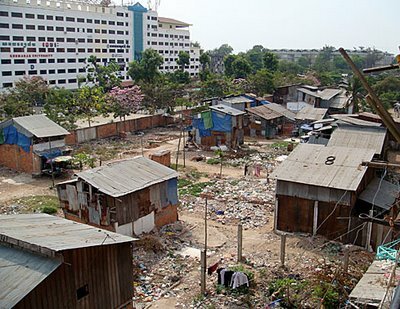 “Phnom Penh: The director of th the National Center for Tuberculosis and Leprosy Control said that Cambodia is excluded from a list of 27 countries of the world with cases of drug resistance related to the most serious tuberculosis, but there are 30 people dying quietly per day in this country. “The director of the National Center for Tuberculosis and Leprosy Control, and an advisor of the Ministry of Health, Dr. Mao Tan Ieng, telling state and private service providers during a workshop on Thursday morning that, according a new report of the World Health Organization, 27 countries of the world with high numbers of patients with drug-resistant tuberculosis, Cambodia is not among those countries. “He went on to say that in Cambodia, there are between 1.2% and 1.3% of the patients that have drug-resistant tuberculosis, and around 5 to 6 people get infected by tuberculosis per day. At present, 50 to 60 patients with drug-resistant tuberculosis are receiving treatment, and there is still medicine left for curing 100 patients with drug-resistant tuberculosis. He said also that per year, Cambodia has between 400 and 500 patients with drug-resistant tuberculosis. “He continued to say that drugs to treat a [normal] tuberculosis patient costs US$20 to US$30, while drugs for a drug resistant patient are US$5,000, when the drug is bought from specific organizations. If the national program and the government want to buy it from this chanel, they have to get the permission from the Green Light Committee in Geneva/Switzerland. If one buys from the outside, around US$30,000 are needed to be spent to buy drugs for a patient with drug-resistant tuberculosis. As the article does not mention why Cambodia is not on the list of the Green Light Committee – whether it applied and was rejected, or whatever may be the reasons – we quote here from a document of this organization. One point seems to be crucial: To receive Green Light Committee support, it is necessary to have a strict control of the procedures to apply the drugs – because otherwise the sickness will become more severe. “It is imperative that second-line anti-TB drugs are used wisely. “The WHO Guidelines For The Programmatic Management Of Drug Resistant Tuberculosis (hereinafter referred to as the Guidelines) provide recommendations for appropriate management of drug-resistant TB so as not to generate further drug resistance. To help programs develop and implement strategies for the management of drug-resistant TB, the Green-Light-Committee for Access to Second-line Anti-tuberculosis Drugs (Green Light Committee) was created by the WHO and its partners in January 2000. “Treatment takes from 18 months to 2 years, while treating normal tuberculosis takes only 6 months. “According to the National Tuberculosis Control Program, since the start of cooperation between state and private services from May 2005 up to the present, the program has been expanded to 11 provinces and cities covering 36 operational districts among the 77 districts of the 24 provinces and cities. “Aiming at effient cooperation between the state and the private services to encourage research about and treatment for tuberculosis patients, Dr. Mao Tan Ieng said that in early December, Ms. Monica from the Green Light Committee in Geneva assessed the cooperation and found good results and some inactive program problems that need to be solved. “An official of the Japan International Cooperation Agency (JICA) associated with the National Tuberculosis Control Program, Dr. Nishiyama, said that JICA supports the cooperation between state and private services that are cooperating to send suspected tuberculosis affected people to be checked and treated with public services of the state. “He added, ‘Some patients go to discuss with private services, which have a very crucial role to find suspected people and send them to receive state services, so that all Cambodian citizens have good health. “On 31 December 2008, the Supreme Court plans to hold a hearing for two suspects who are accused murders who shot dead the president of the Free Trade Union of Workers of the Royal Government of Cambodia, Mr. Chea Vichea, on 22 January 2004 where the Appeals Court kept the verdict of the Phnom Penh Municipal Court convicting each of them to serve 20 years in prison. “In the meantime, Amnesty International released a statement asking the Supreme Court of Cambodia to release the two suspects, Bon Samnang and Sok Sam Oeun. While they are being held in prison, the real murderers and colluders are still free from being brought to be convicted according to the law regarding the murder of this trade union leader. “Amnesty International said in its statement that the Supreme Court must release the suspects Bon Samnang and Sok Sam Oeun immediately. Both of them were arrested by the authorities a few days after Mr. Chea Vichea was killed by unidentified murderers in the morning of 22 January 2004 at a newspaper stall at the west of Wat Langka; the two suspects will be before the Supreme Court on 31 December 2008,after the Appeals Court upheld the conviction verdict of the Phnom Penh Municipal Court to send them to jail for 20 years, even though prosecutors had claimed that there was not enough evidence to convict both of them. “Amnesty International added that there was tortures to extort confessions from the suspects Bon Samnang and Sok Sam Oeun, intimidations of witnesses, and intervention of politics into the implementation of the law. Also, in the detention, there were illegal activities conducted against the two suspects. The Amnesty International suggests for independent investigations in order to bring the real murders to be convicted. “A researcher of the Amnesty International, Ms. Brittis Edman, said that confessions of the suspects Bon Samnang and Sok Sam Oeun were obtained by beating in detention by police, and the promise of awards was used to provide evidence for the court to sentence them to serve 20 years in jail unjustly. “She added that the two suspects, Bon Samnang and Sok Sam Oeun, withdrew their fake confessions and the court cannot considers their confessions as evidence to convict them because they were obtained by force. “Ministry of Interior spokesperson Khieu Sopeak denied these accusations and said that the court has not rejected to continue investigations by the authorities, and the authorities wait to follow the court’s decision. “Local and UN human rights organizations in Cambodia went to conduct investigations in a village in Neak Loeang – where Bon Samnang’s girlfriend’s house is – during the Chinese New Year, and villagers asserted that Bon Samnang was at that happy time among them and with his girlfriend, and that he is not the murderer who shot Mr. Chea Vichea to death. “Also, the former King had said that Bon Samnang and Sok Sam Oeun are not the murderers who killed Chea Vichea. Every year, officials of many human rights organizations regularly gather for a prayer according to Khmer tradition, like releasing birds and floating balloons, to give signs of the demand to the court to release the suspects Bon Samnang and Sok Sam Oeun, to be free like other Khmer citizens. “Mr. Chea Vichea’s younger brother, Mr. Chea Mony, had called on the court to release the suspects Bon Samnang and Sok Sam Oeun, saying that they were not the real murderers. A woman who was a newspaper seller at the west of Wat Langka, where Mr. Chea Vichea was murdered on 22 January 2008, had written to the Appeals Court from Bangkok in Siam [Thailand] before she left to a third country, after receiving the right to asylum, saying that she had seen the murderers clearly, and Bon Samnang and Sok Sam Oeun, who are being detained, are not the real murders who killed Mr. Chea Vichea. But she could not say it immediately when the event had happened, because the police prohibited her from making a statement, and they made her to say what police planed for her to tell journalists and officials of national and international human rights organizations [before she fled abroad in fear]. Awarding Ceremony for Three Cambodian Journalists Competing to Write ‘Reporting on Rural Development’ [Ms. Kang Kalyan from Cambodge Soir won the first price receiving US$700, followed by Mr. Tieng Mongkul from Sahakum Kien Svay winning $500, and Ing Chamroen from Cambodge Soir on the third rank winning US$300. “Vietnam Airlines and the Yuon [Vietnamese] authorities prevented two members of the European Parliament to travel by plane from Cambodia to Yuon yesterday, on 23 December 2008, under the pretext that there will be a huge demonstration by Yuon citizens in Hanoi against the presence of the two European Parliament members. “This prevention by the Yuon authorities happened when the two European Parliament members planned to meet parliament members and officials of the Hanoi government to talk about the demands for human rights and freedom for tribal Montagnards, and about the demands for full freedom of religious practices, and for the rights for Khmer Kampuchea Krom monks and citizens, who are living in their homeland under the control and restrictions of their right by the Hanoi government, and about the demand for the release of Monk Tim Sakhan and five other Kampuchea Krom monks in Kleang [former Khmer name – now the Trăng Province of Vietnam] who are in jail. “At 12:40 p.m. on 23 December 2008, Mr. Marco Panella and Mr. Marco Perduca, members of the European Parliament, arrived at the Phnom Penh International Airport to get into a plane of Vietnam Airlines to Saigon. But before they got into the plane, they had to wait for a period of time and then, Vietnam Airlines gave them a letter which is not from the Vietnamese government, but it is a letter of a Vietnamese travel agency, the Vungtau Intourco Hanoi saying, ‘According to a request by the Vietnamese Embassy in Rome in Italy, regarding the visas proposed for permission to travel to Vietnam from 18 December 2008 to 18 January 2009, Mr. Marco Panella and Mr. Marco Perduca have to show documents about their work program for their visit to Vietnam, according to Vietnamese laws about visas to enter Vietnam. “Vietnam Airlines added that it could not contact the European Parliament members [who were traveling] to ask for their work program in Vietnam, according the Vietnamese law; therefore, Vietnam Airlines notified them that the company cannot allow them to board he plane to Vietnam. “Mr. Marco Perduca told journalists in a press conference at a park in front of the Hotel Le Royal in the afternoon of 23 December 2008. According to information he got from the Italian Embassy in Hanoi, the Ministry of Foreign Affairs of Vietnam delivered the information that there are letters of Vietnamese citizens opposing the presence of both of them. That is the reason why the Vietnamese government is worried that it cannot protect the security for them and the Vietnamese government suggested both of them not to travel to Vietnam. “Mr. Marco Perduca went on to say that both of them come to visit Cambodia and after that, they will move to Vietnam for an unofficial visit. In Cambodia, he met Khmer Kampuchea Krom communities and monks on Sunday of 21 December 2008, and he met also members of the National Assembly from the Sam Rainsy Party. They will continue their travel to Vietnam to meet government officials as well as members of the Vietnamese parliament. They will visit Khmer Kampuchea Krom communities, members of the Catholic church, and Montagnards, and will demand the release of five Khmer Kampuchea Krom monks who are being jailed, and demand to send Monk Tim Sakhan to be sent back to Cambodia and to release a 90-year-old man, a religious leader, who is being held in his home. He added that according to officials of the Italian Embassy in Hanoi, their visas have not yet been canceled, and parliament members and government officials of Vietnam are prepared to greet them. It is strange what happened at the Phnom Penh International Airport of Cambodia, preventing them to get on the plane to fly to Vietnam. “Mr. Marco Panella said that it is a simple thing that two of them want to travel to Vietnam to meet with government officials and parliament members of Vietnam, but they could not even get into the plane. The Ministry of Foreign Affairs of Italy told that there is no change and the visas to Vietnam are still valid. As for the information that there will be demonstration against them when arriving Vietnam, he said that it is an honor if Vietnamese citizens hold demonstration against them and that the Vietnamese authorities cannot protect both of their lives. “Medicines are double-edged weapons. During a meeting last week, officials found that fake medicines are strongly invading Cambodia. The Ministry of Health, the parent or the administrator of this sector,] has not any significant achievements responding to the size or the spread of fake medicine trafficking, or of unqualified medicines. “The Cambodian government created central and provincial committees to eliminate fake medicines and illegal health services in 2005. So far, by late 2008, the highest health institution has changed ministers, from Minister Nuth Sokhom to Minister Mam Bunheng, but there is no positive change in the prevention of fake medicines’ trafficking. Moreover, the fact that there is not much debate about the problem, means that it is an opportunity for fake medicines to extend their influence. “It is reported that not much is done to curb the use and the speculation with fake medicines in the provinces, while at the central level, it is completely quiet. During more than three years, the central committee met only once in 2006, after there had been some encouragement from non-government organizations. “How many types of fake medicines has the Ministry of Heath found? Where do those types of fake medicines come from? What are they? Was information about them was published for the public? Were warnings published in time? Or are they first waiting until the merchants have sold all medicine, only then publish something in order to make a good impression in the public? Did the central committee create strategic plans to handle this problem? If it did, were evaluations conducted? How many times was information about the results given to the Royal Government? “The import of fake medicines into the country causes countless losses. Fake medicines do not care whether they affect ministers, parliamentarians, doctors, customs officers, police, the rich, the poor, soldiers, teachers etc… Not only the users are affected, but also those who are not users may have problems. “Unlike the quietness of the central committee, other institutions focus on this dangerous problem. Non-government organizations and international organizations, like INTERPOL, had encouraged the central committee to be active again, but it seems it has no effect. “Besides fake medicines, a big danger are also the many illegal clinics [clinics operating without license];tese too harm citizens’ health. Illegal clinics are not just like persons who sell drugs secretly so that police cannot see it, but these are illegal clinics with big banners along main roads in cities and in various towns. Therefore, if the Ministry of Health has the intention to check these illegal clinics, it is not difficult. But it seems that the Ministry of Health has no intention to do so. It is said that expert officials of the Ministry of Health receive thousands of dollar monthly from those illegal clinics. “Not just illegal clinics need to pay monthly bribe-fees to officials of the Ministry of Health, even for the imports of material it is necessary to pay to official of the Ministry of Health. To sum up, officials of the Ministry of Health know the evil merchants of fake medicines and those illegal clinics like their own palm. “To be a model for the world, the Khmer Rouge Tribunal, created by the Phnom Penh government and by the United Nations, should have a broader access to information, or make it at least comparable to the tribunal, supported by the United Nations which convicted the initiator of the genocide in Rwanda. “This recommendation, one among four recommendations presented by civil society organizations, including the Cambodian Defenders Project, the Cambodian Human Rights and Development Association – ADHOC, the Khmer Institute for Democracy, the Cambodian Justice Initiative (which is a section of the Social Justice Initiative), is said to help improve the potential of the tribunal. “This statement added, ‘If the Extraordinary Chambers in the Courts of Cambodia have to provide positive examples for the judicial system in Cambodia, this court has to guarantee transparency immediately, and strengthen the involvement and discussion with different non-government organizations again. “Other recommendations relate to the monitoring by the United Nations side of the court, by the UN law office which brings the leaders of both side, Cambodia and the United Nations, together at the administration of this court, and finally, pointing to the important role of donors for the management of the funds provided to the court. “The head of the Public Affairs Office at the Khmer Rouge Tribunal, Ms. Helen Jarvis, said that recently, the court conducted two events published through television, about the decisions of two hearings of the court and also a joint statement by the co-prosecutors was issued. “The coordinator of the Cambodian Justice Initiative, Mr. Long Panhavuth, said that the long process of investigations by the tribunal make the publics tired, as it is still not possible to predict what the court really continues to do, especially when the rest of the hearings will start.